Is your drain clogged? is your sink, shower or toilet overflowing due to a severely clogged drain? If so, our skilled plumbers can help! 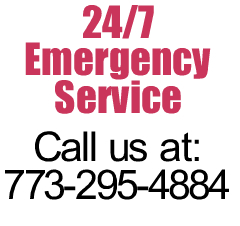 Click to Call 773-295-4884 for 24-hour, emergency service. Our plumbing technicians are trained to deal with drains that are clogged due to many factors. We can help you remove the block from your drains and tell you exactly what it will take to clear the line. Sometimes it may be due to a sewer that is backed up, sometimes it is as simple as rodding the drain. We don’t know until we can come out to your home and assess the situation. Jesse the Plumber can help you outfit your home to ensure every precaution possible is taken to prevent flooding due to a clogged drain in your home from happening again. Some things your plumbers and your family may consider implementing following a flooding episode: backup sump pump or generator, exterior or interior drains, and sealing foundation flaws and cracks. What you can do until help arrives. Gather precious belongings and artwork – put them in a safe place. Lift furniture and wood-based items onto pieces of wood or foil to keep them away from wet floor or carpeting. In summer, put on air conditioning to decrease moisture. Remove excess water (blotting and mopping). Set wet cushions and pillows out to dry. What you should NOT do. Do not turn on any electric devices as outlets may be damaged and can be an electrocution hazard. Do not leave any cushions, paper goods (books, magazines, photos), or fur or leather goods in a flooded space. Safety first! Assess the safety of the area before entering. If the possibility of mold or bacteria is present, outfit yourself with proper gear (goggles, boots, gloves, etc) or wait for a professional to arrive. The deeper the water, the greater the danger. Do not, under any circumstances enter a deeply flooded basement. Let us help you protect your basement from flooding. Click to Call 773-295-4884 to speak to a customer service representative, and we will dispatch a certified-technician. 24 hours a day, 7 days a week, we are available for any plumbing emergency including drain cleaning Chicago. Our staff can dispatch an emergency plumber Chicago to your home for service within 1 hour. We also provide Chicago water heater repair service as well as all other plumber Chicago assistance you may need.